You would think that by now everyone involved in financial markets would be familiar with Einstein’s famous aphorism, which held that the definition of insanity is doing the same thing over and over but expecting a different result. Needless to say, that truth has not penetrated the central banks—and it’s been lost entirely on the day traders, speculators and robo-machines still scampering round the casino. Still, after the third financial bubble of this century has reached its asymptote why would anyone not expect it to end badly? Or why would anyone think that serial reflation of these bubbles is leading to the land of milk and honey? The truth is, Keynesian central banking has fostered a progressive and intensifying de-coupling of financial asset values from the underlying economy, meaning that over time the system has become increasingly unstable and incendiary. For instance, since the arrival of Bubbles Alan Greenspan at the Fed in Q3 1987, the S&P 500 has risen by 7.25% per annum, while nominal GDP has grown by just 4.65% per annum. That is, the stock market has been rising at 1.56X the rate of national income growth, and not just for a few years or in the context of some kind of aberrant but temporary financial cycle. This decoupling has now been going on for fully one-third of a century. So we’d call that a trend! And one that is so embedded in the fabric of economics and finance that its end game is the paramount uncertainty and risk of the present era. Stated differently, we are not in some kind of timeless, recurring cycle that is the same thing, over and over again. To the contrary, it’s sui generis—-a freakish outbreak of history that has never before been witnessed. For instance, during what might be called the golden era of 1955-1987, the growth rate of nominal GDP was about 8% per annum and the S&P 500 rose at a slightly lower 7% annual rate. That made sense because it indicated that the Economy was in the drivers seat and that Finance was its servant; and that stock market capitalization gains were a function of income and profit growth, not the artificial stimulus of money printing central bankers. Moreover, since the very essence of the present inversion—-asset value growth at 1.56X income growth—defies financial logic and common sense, its ultimate resolution does not promise to materialize on the bright side of historic experience. That is to say, the monetary errors of the last one-third of a century imply a pall of financial risk and danger that can’t be ascertained by merely consulting the stock traders’ chart books. What has materialized as depicted in the graph below, therefore, is a new ball game and the ultimate case of Herb Stein’s famous law. To wit, that which is unsustainable, tends to stop. You would think, for instance, that the Fed heads who chanced to gaze upon the above chart night be puzzled as to why the first two bubbles got so out of hand and then crashed; and also why the far more egregious bubble now in full inflation mode would not meet the same fate. More importantly, it is a wonder that they have not seen the obvious causation sequence that has emerged full blown from the world of Bubble Finance created by Alan Greenspan and his heirs and assigns, and then moved to treat with it prophylactically. We are referring to the obvious reality that crashing financial bubbles now cause main street recessions, not vice versa per the pre-1990s pattern. Yet if preventing the societal harm which results from unnecessary recessions constitutes the essence of its mandate, the Fed’s increasingly defiant denial of financial bubbles is all the more insensible. After all, back in December 1996, Greenspan did worry aloud about the danger of “irrational exuberance”, and for at least a few meetings thereafter the Fed took action to nip in the bud the incipient tech bubble than forming. At length, the Fed heads lost their nerve and convinced themselves that “this time is different” and that there was no stock market bubble because, among other things, productivity growth had allegedly gotten up on its hind-legs and leapt over the boundaries of all prior experience. 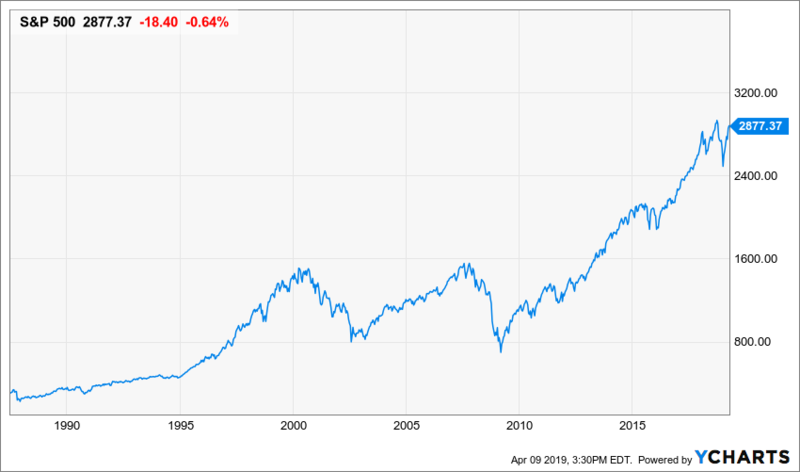 It had not, course, but after the thundering crash of the dotcom and tech bubble in 2000-2002 during which the leading edge of the bubble represented by the NASDAQ-100 imploded by 85%, the Greenspan Fed invented an even more specious excuse. Namely, that bubbles could not be detected in advance or effectively treated with via monetary policy action. Accordingly, the function of the Fed was to pump maximum financial juice into Wall Street in the belief hope that it would be transmitted to main street production, jobs and income; and then to function as the clean-up brigade by hosing Wall Street with a tsunami of liquidity in the event that such purportedly undetectable bubbles should perchance splatter. After the bubble collapsed again in 2008-2009, it only got worse. The single most crooked thing in all of Wall Street’s machinations is the hockey stick of ex-items forward earnings. These hockey sticks always grow by about 10-15% into the forward year, and omit tens of billions of so-called non-recurring charges to income under GAAP—charges that are absolutely real and constitute the consumption of cash and other corporate assets. So you would think that the central bankers would at least cast a squinty eye upon this orchestrated Wall Street scam because the recorded facts of history make kindling of these sell-side hockey sticks. For example, way back at the pre-crisis peak in June 2007, the LTM earnings of the S&P 500 came in at $85 per share. Eleven years later in December 2018, LTM earnings posted at just $124 per share when you adjust for the one time impact of the 21% corporate rate in 2018, which otherwise makes the two figures non-comparable from a “growth rate” perspective. In any event, the peak-to-peak growth rate for the entire 11-year period is just 3.3%. And when you strip out the share buybacks and inflation during the interim, you are lucky to get 1% real growth. So why anyone could think that paying 23X current S&P GAAP earnings for 1% real growth over the cycle makes any sense at all is a considerable mystery. But the fact that all of these considerations escape the Fed heads entirely and that they continue to cite Wall Street sell-side propaganda as proof that no bubbles or financial instability threatens—-proves that they are indeed caught in the snare of Einstein’s definition. So here’s the thing. The central bankers guild now running the entire financial system is so pre-occupied with Keynesian models of the macro-economy and mumbo-jumbo about the economic witchcraft of central banking that they cannot even see the obvious point that cheap money market interest rates are the mothers milk of speculation; and that massive monetization of public debts and other financial assets only artificially and destructively inflates the values of the same. Instead, our Keynesian central bankers palaver endlessly about an invisible benchmark called r-star or the neutral rate of interest; gum incessantly about a long-ago discredited Phillips Curve; and wax proudly about “tightening” monetary conditions, which boils down to little more than episodic efforts by the market to rein-in vastly artificial risk spreads and stock prices. But the facts mock all of those self-serving rationalizations because what the Fed continues to foster is the artificially cheap money and uneconomic cap rates upon which three decades of Bubble Finance have been erected. After all, the current 2.40% funds rate being assessed by the traders as 60% likely to be cut before year-end is just 25 basis points above the 2.15% inflation rate (CPI less food and energy) of the last twelve months; and after the Donald’s wacky call for a 50 bps cut would be back in negative real yield territory, where it had been for 123 months running before November 2018. The truth is, there is not a snowball’s chance in the hot place that a money market rate just 25 basis points above the inflation rate could possibly harm the main street economy. For instance, if the December increase were fully passed through to borrowers it would have amounted to a hairline difference in the current 4.71% average rate on a 60-month auto loan. And the same would be true of its impact on the current average 30-year home mortgage rate of 4.08%, the average prime rate on business loans of 5.5% and the average credit card rate of 17.7%. As to the latter, it would cost shop-until-they-drop consumers just 1.4% more to use their plastic. So we are quite certain it could not slow down hits to the “order” button on Amazon by one bit. In short, when we are talking about the cost of money to real borrowers on main street the December increase was a rounding error; and so would be another 50 or 100 basis point rise in the money market rate on top of that. For crying out loud, during the seven years over 1994-2000 the federal funds rate averaged far higher. In fact, at 4.80% it exceeded the average core CPI (less food and energy) rate of 2.55% by fully 225 basis points. That is, the money market spread over inflation, or the real rate, averaged 10X greater than the level resulting from the December increase, and from which the day traders were arm-in-arm with the Donald and his cheerleaders stomping their feet and pouting loudly for relief. Yet back in the 1990s a meaningful return on liquid savings over and above the cost of inflation and taxes did not bring down the economic house. Real GDP growth, in fact, averaged 3.5% during the period. So here, again, is the Fed’s sugar bowl. That is, the living proof that after two spectacular financial bubbles and crashes already this century, they have learned nothing at all; and in fact have doubled down on the very cause of the prior financial calamities. The fast expanse between the brown line (trend CPI inflation less food and energy) and the purple line (effective Fed funds rate) amounted to speculators’ heaven because it permitted Wall Street traders to put on margined or optioned positions with 90% or better leverage—borrowings which cost less than the going inflation rate. In a word, the policy embedded in the chart below was a massive subsidy for speculation, and that’s exactly what happened. Again. Now that they have brought the bubble to the edge of collapse for the third time, we leave it to the ever perceptive Sven Henrich, who this AM captured what comes next about as well as possible. Eyes wide open. That’s my mantra here. The biggest concern from the short side here is that central banks out of sheer panic in December have lid fire to a potential blowoff top bubble here, crushing rates to re-inflate the TINA effect, making money cheap again, letting zombie companies sustain themselves again and forcing money back into equities. And you can see the agonizing left, right and center. Hedge funds are hopeless underperforming comp again, because any portfolio built on hedging, diversification or utilizing any sort of risk management, i.e. cash, will underperform in a market environment where price only goes up, especially price that favors the large cap monsters again. No, to perform you need to have exposure to the high fliers, you need to be fully invested, and throw all risk management out the window. This is what they have done. Again.And now people are forced to chase. It’s frankly idiotic, it’s reckless, but it’s the environment we have. This is also where the central banks are now perched. That they did not even notice how far out on the limb relative to history they were treading is perhaps the greatest part of the insanity of all. Well, perhaps, except for the implicit assumption on Wall Street that stock crashes and recessions are now sweat because the Fed and other central banks will quickly effect a rebound. Then again, some tricks can’t be done over and over again, whether insane or not. Extended up in the nose-bleed section of history, central bankers may prove exactly that after the third great bubble of this century finally crashes. In the meanwhile, the rotten fruit of Bubble Finance has continued to fester. During Q4, stock buybacks soared 63% from a year earlier to a record $223 billion. That now only beat the prior quarterly record set in the third quarter last year of $204 billion, but was the fourth quarterly record in a row. 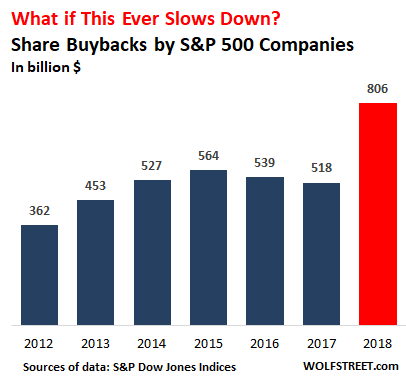 More importantly, for 2018 as a whole, buybacks soared 55% over 2017 to a record $806 billion. That beat the prior record of $589 billion set in 2007 by 37%. And, of course, we know what happened next. As we said, Einstein’s aphorism has never been more apt.